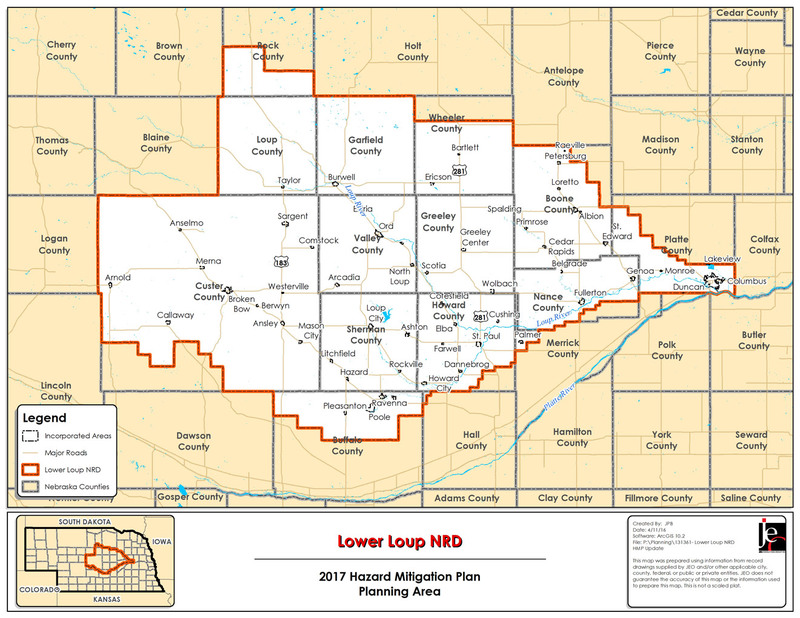 The Lower Loup Natural Resources District (NRD) in collaboration with JEO Consulting Group, Inc. is in the process of updating the 2011 Multi-Jurisdictional Hazard Mitigation Plan (HMP). The NRD’s existing HMP was approved by FEMA and adopted by participating jurisdictions in 2012. FEMA requires that an HMP be updated and approved within a five year period. An optional hazard mitigation planning workshop was held on Thursday, June 9, 2016 at the Valley County Fairgrounds in Ord. This workshop explained what a HMP is, how it benefits communities, how communities can participate, and identify the types of information needed at future meetings. The intent of the July Round 1 public meetings was to provide a brief overview of the hazard mitigation planning process and gather information needed to complete a draft of the plan. At this meeting, we identified the hazards of greatest concern, identified critical facilities, and updated the status of mitigation projects selected during the last hazard mitigation plan. Public meetings were held in Albion, Genoa, Broken Bow, and Ord. The intent of the October Round 2 public meetings was to: identify specific projects to reduce the impacts of hazards, review the updated participant section, and collect any missing information. Public meetings were held in Albion, Genoa, Broken Bow, and Ord. The Hazard Mitigation Plan has received approval pending local adoption by the Federal Emergency Management Agency (FEMA). At this time, each participating community must adopt the plan via resolution to quality as a participant in the Hazard Mitigation Plan Update. Once a jurisdiction adopts the plan, they are eligible for project grant funding to assist with implementation of actions in this plan. Please contact Phil Luebbert with questions about plan adoption.